The Prime8 has gone through a redesign to make it better than before! 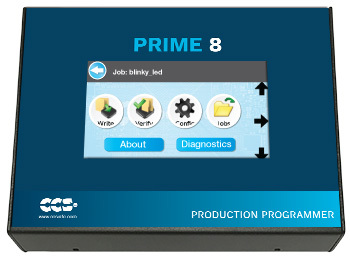 The Prime8 production programmer is a gang programmer than can program 8 PIC® MCUs simultaneously. It can operate via software control over a USB connection, or it can operate without a PC by storing files inside its memory. The most impressive update is a touch screen LCD, featuring a much simpler and easy to use user interface. This new UI makes it easy to choose a file and program a file, as well as making it easier to configure the unit. The UI has also been upgraded to show more information about the files stored in its memory. The speed at which PIC® MCUs can be programmed are also improved. For instance, programming a full PIC24EP256GP206 results in almost 75% reduction in time when using the new Prime8 versus the older models. The internal memory has been upgraded to 8 megabytes, allowing the user to store eight 1 megabyte files (an improvement over the 2 megabytes and four files of the older models). If a file is larger than 1 megabyte, it can still be stored by using multiple slots of the Prime 8's internal memory. If 8 megabytes of memory isn't enough, it can be expanded using a USB thumb drive connected to the Prime8.